Some interesting stuff has come our way from a variety of comics scholars recently, with more to come. 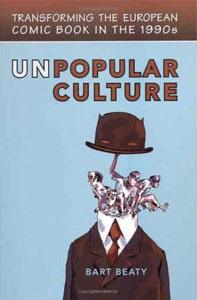 Firstly, there is Bart Beaty’s long-awaited book, Unpopular Culture – Transforming the European Comic Book in the 1990s, on the new wave of auteur comics that helped transform the French-language comics market through the 90s , and which today stands as a major development in Western comics. It has yet to fall within my reach, but as a long-time reader of Beaty’s writings on comics in The Comics Journal and on Comics Reporter, I am definitely looking forward to reading it. Beaty here laments the problems of writing about artists who are still working – especially if they are as prolific as Lewis Trondheim – but on the bright side, his book is the first comprehensive study of this important phase in the development of the medium. 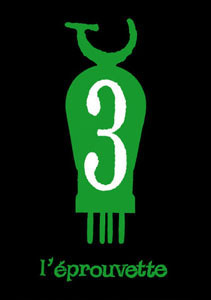 (By the way, the book is on special offer through comicsresearch.org). Beaty’s also involved in the soon-to-be-released English-language edition of Thierry Groensteen’s important foundational study of the comics medium, Système de la bande dessinée (1999), which in Beaty and Nick Nguyen’s translation has been given the title The System of Comics. Système is a thorough if slightly pedantic structuralist analysis of comics as a medium that takes as its fundamental building block the comics panel, which is then extended to larger structural elements such as the page, the sequence, and the book. This is all well and good, but slightly anodyne and not particularly stimulating in terms of thinking about comics (and choosing the panel as the basic unit is rather arbitrary – why not elements within the panel? Why not the first mark put on paper by the cartoonist? And what’s the use of an arbitrarily determined basic unit anyway?). 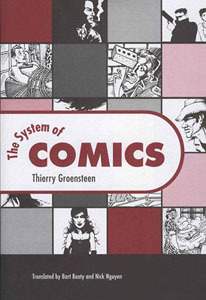 However, Groensteen is simply too knowledgeable a scholar and good a writer to produce something uninteresting and the book also contains a number of fascinating insights into the problem of defining and describing the comics medium. In any case, I recommend that anyone interested in comics as a medium and an art form read it. I do however, hope that the cover design that I have seen and which is reproduced here is not the final one. Jeez, it is ugly. Your typical academic slap-together of images, conveying an awareness of graphic design being important on the part of designer, but without the imagination and skill to carry it off. And the illustrations are amateurish. Not at all the level of sophistication Groensteen’s text calls for. The original design using a minimalist comic by Francois Ayroles, is perhaps very French, but much more stylish and appropriate. And while we are talking about Groensteen, there is of course his edifying new book on the cultural context of comics, La Bande dessinée – Un objet culturel non-identifé, which I briefly reviewed here, and which was the subject of a roundtable at Angoulême. And there is also the third and final issue of Jean-Christophe Menu and L’Association’s critical journal on comics L’Éprouvette – a massive c. 600-page tome continuing the discussion of a possible comics avant-garde, of comics’ relation to the pictorial arts, and of the French-language comics market. Highly ambitious and more or less unprecedented in comics criticism, it is essential to anyone concerned with these issues. I hope to return to it and treat it more fully in the not too far-future here at the Metabunker (read Beaty’s review of the first two volumes here, and Paul Gravett’s mention of the latest one here, as well as Menu’s comments about L’Éprouvette in my interview with him here.). Also, Don Ault and his gang at the University of Florida last week released a new issue of their interdisciplinary digital journal on comics, ImageText. This time around, the focus is on William Blake and there is a whole slew of interesting-looking articles up about the man and his art, as well as his relation to modern comics. Personally, I am looking forward to getting (re)acquainted with Ault’s thoughts on The Four Zoas, parts of which he included at his frenetic lecture at the Copenhagen conference on comics, Comics and Culture, back in 1998 (whoa, it has already been almost a decade! ), which is included in the anthology published in conjunction with the conference, reviewed at Rackham here.). More on the newest ImageText here later, hopefully. Oh, if you are at all interested in issues of plagiarism and/or pirating or merely enjoy well-crafted and thought-out criticism, do yourselves a favour and read this wonderfully clever article from Harper’s by Jonathan Lethem. Eddie Campbell linked to it last week in conjuction with his interesting posts about Roy Lichtenstein and plagiarism (here and here), which spilled onto the Metabunker (here and here).